Our neighbor is perhaps the greatest neighbor ever..okay, maybe not ever, but he’s pretty great. He brings fresh crab whenever he goes out crabbing. On this occassion he brought over about 6 blue crab (already steamed). I cleaned the crab and put the meat aside for crab cakes. 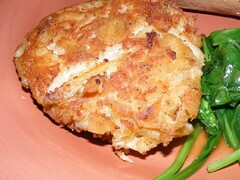 It probably yielded about 2 cups of meat, maybe a bit less…it was enough to make 4 sizeable crab cake patties. As per request from my Grandmother, I made fresh veggie lasagne. 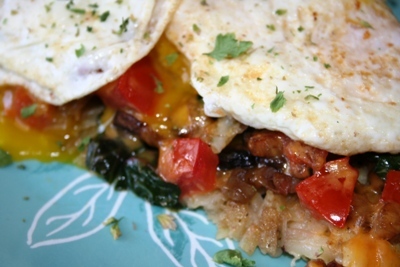 This is a great way to get rid of left over veggies, or plan ahead and use your favorites. This lasagne is spinach and mushroom. To start, I made the lasagne noodles. This is easier than it sounds and totally worth it. I happen to have a pasta attachment for my kitchen aid mixture…. 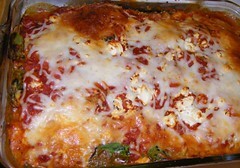 Top with final layer of noodles, and cover with mozarella. Bake at 350 degrees for about 40 minutes until brown and bubbly. The other day Mimi posted her Mac and Cheese and of course it made ME want mac and cheese. So…here is my version of this perfect comfort food. I use a really basic recipe. Remove from heat – add 2 cups of shredded cheese (whatever you like) For this one I used a combination of sharp cheddar, goat cheese and fontina…yums. 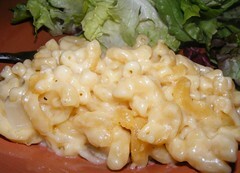 In a greased baking dish add cooked pasta and cheese sauce – bake for 25 minutes until bubbling. 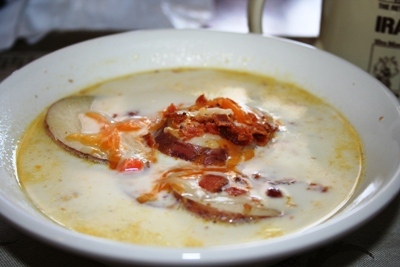 It doesn’t get much better or much easier than this for pure comfort food. Good dinner on a Friday night. 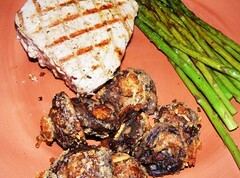 Grilled tuna lightly seasoned with salt, pepper and a bit of parmesan cheese and then grilled about 4 minutes per side. 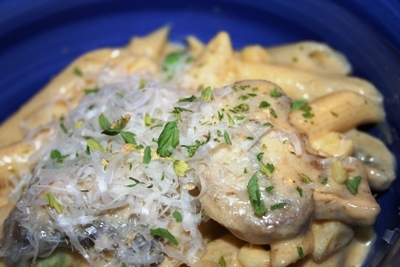 Baby portabello mushrooms with garlic, bread crumbs and parmesan cheese – baked in the oven at 425 for about 15 minutes. The asparagus was lightly seasoned with olive oil and balsamic vinegar and just cooked through in a saute pan. Nothing hard about this dish at all – just a bit of planning so that everything gets done at the same time and it all comes out hot. Start the mushrooms first – then the tuna, when you turn the tuna over after the first 4 minutes -start the asparagus – the thinner the aspargus the quicker the cooking time, so be careful not over cook it. We enjoyed this with a pinot/shiraz blend. Macaroni and cheese has to be the undisputed queen of the comfort food kingdom. Today has been a pretty cold day, and when I got home from school, I was craving a great big bowl of gooey, cheesy macaroni. I checked out a couple of Rachael Ray cookbooks from our library (I really try to hate her, but I get really good, quick dinner ideas from her books and magazine) and there are about a billion different variations on mac and cheese in both books. I chose one that combined broccoli with mac and cheese. Of course, I didn’t have any broccoli, so mine was actually pea, mushroom and corn mac and cheese. The recipe was pretty standard- boil the pasta, make a white sauce, add humungus amounts of shredded cheese of your choice and stir everything together with the veggies. If you want to see the recipe, check out “Rachael Ray 365: No Repeats.” But really- you can wing it and get the same results. I will say that the resulting mac and cheese was really tasty- I think it’s the addition of dijon mustard and a bit of cayenne to the finished cheese sauce that gives it that push into delicious. I will make it again, although next time I will add some sort of protein to beef up the nutritional value. I also think a Spanish version with chorizo and maybe some green chili would also be really good.